At about 9pm on January 26th, year 1700, the pacific northwest was rocked with an earthquake measuring between 8.7 and 9.2 magnitude. The Megaquake was powerful enough to generate a tsunami recorded in Japan. The recurrence interval of this earthquake is a mere 243 years, so today we are overdue for a major earthquake that could change the landscape of the pacific northwest for a generation. Leading seismologists predict, when factoring in the time since the last event, that there is a 15-18% chance of a M9 and a 25-40% chance of a M8+ earthquake happening in the next 50 years. Moreover, this isn’t the only seismic risk in our region, as the 7.9 Alaskan quake reminded us just this week. We live in the Ring of Fire, it’s a fact of life here, and if we love the trees, mountains, and water around us then we should acknowledge the energy and fire that sculpted our environment with the same reverence. It is not simply something to fear, it is something to respect. According to best estimates provided by the State of Oregon, the State of Washington, USGS, the Canadian Government, and various academic institutions – a Cascadian Subduction Zone earthquake would devastate our region, causing billions of dollars in damage, with tens of thousands of dead or injured people, in the largest natural disaster to have ever hit the US. We can change that. On an individual level you can prepare, and on a cultural level we can change. The quake might not even happen in our lifetimes, but even still, one should keep camping gear, food, and water for you and your family for 14 days. Just as we demand safe roads from our government, we must insist that our City, County, and State government understand the risks and prioritize easily adopted legislation that can save lives. Oregon has done an exceptional job, but the State of Washington and the British Columbia region have a long way to go. Quake preparedness at the state level in Washington actually got worse last year, as identifying school buildings at risk of collapse was deprioritized, school quake drills are now optional and the State of Washington can’t fund $15 million in recommendations. This is squarely on the shoulders of Governor Jay Inslee to fix. We don’t need to spend 2018 focusing a significant portion of our time on event that might never happen. Yet we shouldn’t ignore the risks, we should respect that the risk is real, and we should respect and acknowledge these risks as a culture. For example, I can’t imagine anyone in Japan laughs at or shrugs off the risk of earthquakes and tsunamis. Japan has over 60 earthquake preparedness theme parks in combination with Nintendo that teach sober lessons – school children take mandatory trips yearly and businesses send employees. Once we respect that the risk is real, we can begin quake preparedness on the individual level. As more individuals respect the risk of a quake our politicians will hear us and prioritize easily accepted safety changes to our cities and infrastructure. A big thanks to /u/fidelitypdx for sharing this post on the reddit.com/r/cascadia subreddit. You can read the original post here. 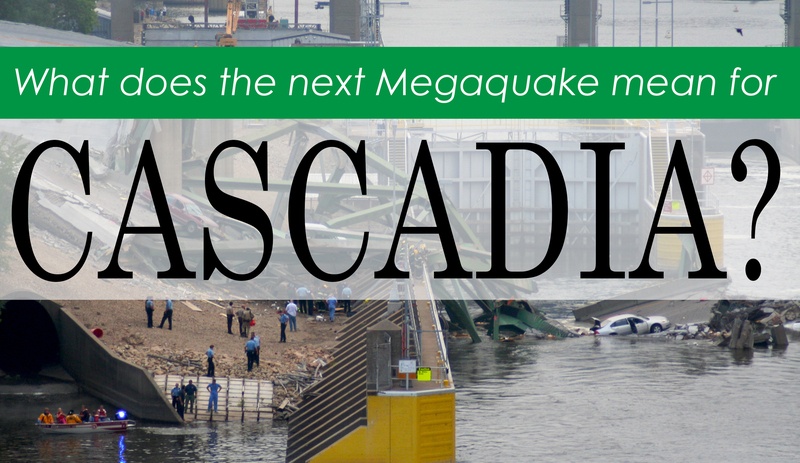 Next ArticleSasquatchia… Cascadia…. a new name for British Columbia? Cascadia Doug Flag and Tri-Doug T’s are in!